Central Vermont Medical Center (CVMC), your community medical center, includes Woodridge Nursing Home, the National Life Cancer Treatment Center and medical group practices. Our medical staff numbers 121 physicians providing care from their private practices as well as from CVMC's sixteen community-based medical group practices. 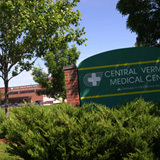 Central Vermont Medical Center is the primary health care provider for 66,000 people who live and work in central Vermont. We provide 24-hour emergency care, with a full spectrum of inpatient (licensed for 122 beds) and outpatient services. We employ 1,300 full and part-time employees. Employment opportunities may be checked here, or through our Job Hotline Telephone number, 802-371-4562. We also depend on hundreds of volunteers and financial contributors who help carry out our mission. Click here to see how you can help. Central Vermont Medical Center is accredited by the Joint Commission of Accreditation of Healthcare Organizations.